Carries a variety of items, including both modern fans and those with a richness of character only found in a shop with a long history. Creates items that combine tradition with new styles and ideas. An entertainment in the Tokugawa era (1603-1868) was a game called "tousenkyou," in which fans were thrown at targets. A wedge-shaped target called the "butterfly" was placed on a stand, and players would take turns aiming to hit it with an open fan thrown from a seated position 1m away. Points were awarded depending on how the butterfly fell. This game became particularly popular from 1773, the second year of the Anei era. Other names for it included "ougi-otoshi" ("fan drop") and "nage-ougi" ("fan throwing"). 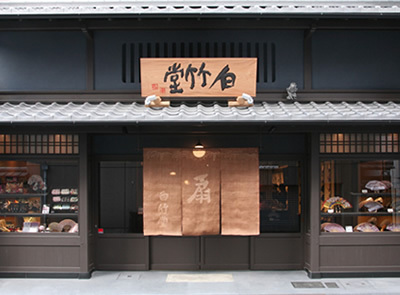 Customers at Hakuchikudo can try tousenkyou for themselves. 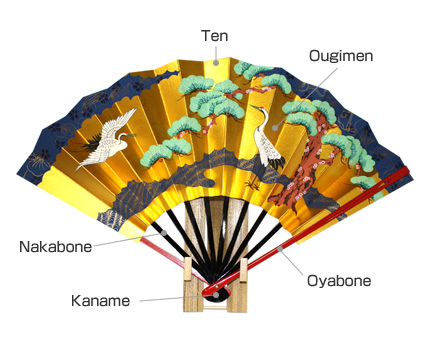 There is debate as to when fans were created, but we do know that they were already in existence at the start of the Heian era in the 8-12th centuries. During this period they were strongly associated with the aristocracy, who carried them to both calm and impress those they met. In the Muromachi era (1336-1573), a variety of fans were specially developed for use in tea ceremony, dance, incense-smelling ceremonies and other popular refinements of the time. It is believed that the Miyako fans of this period were made of thin slats of wood (usually cypress) bound together. 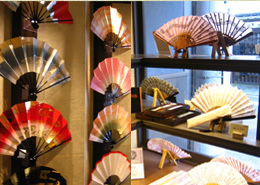 Paper fans were then developed, and in the 13th century these started to be exported out of Japan. 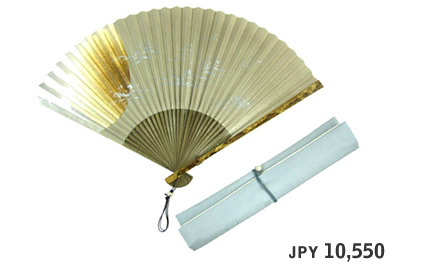 Miyako fans are produced in a series of stages, including those in which the spines and paper are made. Each of these stages is undertaken by a different craftsperson. 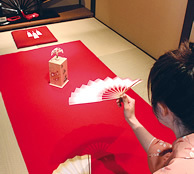 The standard paper fan uses Japanese paper with such decorations as painted art and metal leaf. A die is used to create folds that will line up with the spines, and gaps are opened in the paper for the spines to pass through. Once the paper has been threaded onto the middle spines it is glued securely to the outer two spines, and then the fan is finished. 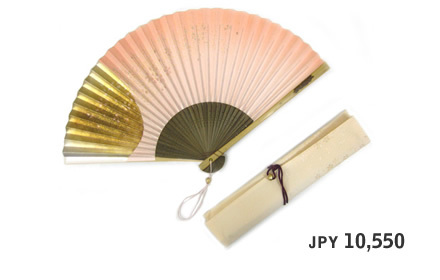 Miyako fans hand-made with care using carefully selected paper and bamboo have a distinct texture and a pleasant feel when held, meaning they are more than just simply beautiful to look at. According to the Shouwen dictionary of Chinese characters, the character for "fan" was originally pronounced in the same way as that for "door." The fan character itself combines the characters for "door" and "wing," suggesting a door swinging back and forth; from this, the concept of a tool for creating a breeze is easily arrived at. When a fan is opened, its tips extend out wider than its origin. This was considered to represent prosperity, and so the fan became a symbol of good fortune. As a result, the start of the Muromachi era saw the beginning of the custom that continues today of sending fans as congratulatory presents. 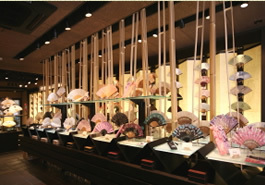 Fans are used in most traditional Japanese celebrations. 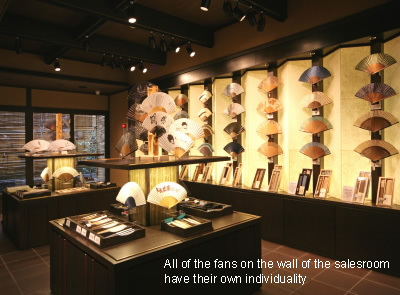 Their popularity extends beyond Japan's borders too, with fans being very popular souvenirs among its visitors. 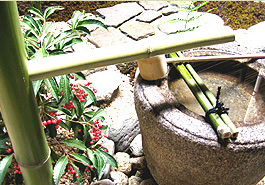 Both the outer and the inner spines are created from bamboo, and then joined together with a pivot. In Japanese, the word for a fan's pivot ("kaname") has long been metaphorically used about any topic to describe a most important feature. At this stage, a die made of paper hardened by persimmon juice is used to create folds that correspond to the number of spines. This is the point at which the work in progress really starts to look like a fan. Round paper fans are made by spreading the paper over the frame, but the method of constructing folding paper fans is different. Three sheets of high-quality Japanese paper are layered so that they form a single sheet, and this sheet is then cut into the appropriate shape. Each fan features one of these compound sheets on each side, with gaps between to allow the spines to be inserted. Now glue is added to the tips of the spines, and they are inserted into the gaps in the paper. The end spines are then heated and given the correct shape, and the fan is completed. Most of the stages of the fan's production are carried out by hand. They are exacting procedures that require constant concentration on the part of the artisans. A pleasant picture on a fan makes you feel cooler before you even use it. In this photo, an artist can be seen carefully painting a picture. Flowing water, blooming flowers and singing birds are given life by her brushstrokes. The outmost and thickest spokes of the fan. The spokes of a sensu are made of materials such as bamboo or other wood, and they sometimes feature designs in e-maki or family crests written in pure gold. Thinner than the outer oyabone. In the production stage called "nakazashi," these are inserted through gaps between the front and back papers. Used to hold the spines of the fan in place. They are made out of materials such as plastic and metal. As this part breaking will lead to the fan becoming unusable, they are its most important component. Most fans feature paper, but some use cloth. Often decorated with materials such as gold foil. The highest point on the fan. An item you can enjoy throughout the entire year, and made using traditional techniques in Kyoto, Japan's traditional heart. This is a "tanchi" sensu fan with the greater part of each spine not covered by paper, so it feels beautifully smooth and pleasant to hold. With silver leaf oxidized in sulfur to create a rarely seen darker tone. 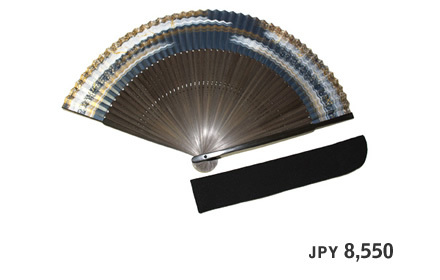 This is a sensu fan with a bold design that still retains a chic air. With silver leaf oxidized in sulfur to create a rarely seen darker tone. Lose yourself in the fine gold leaf design. The restrained colors mean that this is a design you will never tire of, and the materials are of the highest standard. 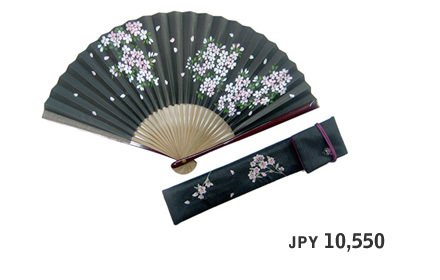 You can see at once the quality of this item, with its design of cherry blossoms in full bloom on a black background. Hand-printed by artisans residing in Kyoto, Japan's traditional heart. Has an air of mature refinement.